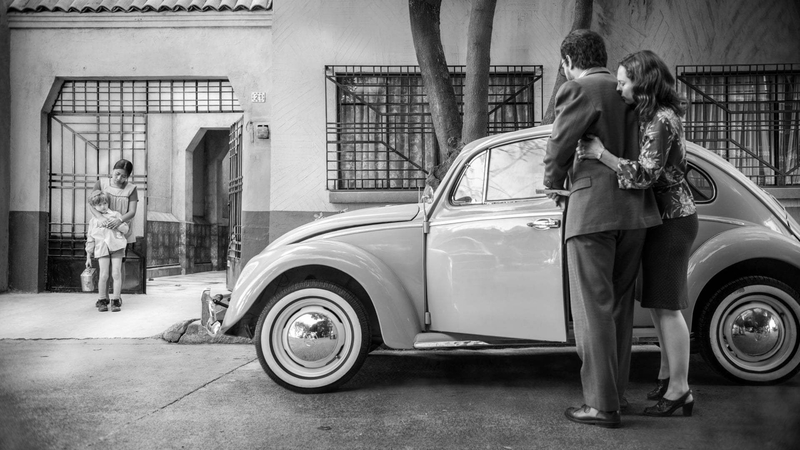 Mexican Academy Award-winning director Alfonso Cuarón returns to his childhood for inspiration with his meticulously beautiful Netflix offering Roma, an autobiographical black and white thank you letter full of warmth and love. Following his triumphant Gravity, which opened Venice back in 2013, Cuarón obviously felt as much need to come down to Earth as Sandra Bullock’s astronaut. Roma takes him back to Mexico in the period from late 1970 to the summer of 1971. We see a portrait of an upper middle class family from the point of view of Cleo (Yalitza Aparicio), a servant of Mixteco heritage descent who sees to their many needs and demands while also finding time to cleaning up the dog muck in the yard. In fact, the first thing we see in the glorious black and white photography is a puddle of soapy water washing across the floor as reflected in the puddle a passenger jet crosses the sky. It is a none-too-subtle hint that Roma is going to be about highs and lows, but also and ultimately connection. Story emerges slowly, as first of all Cuarón sets up the geography of the spacious house and the relationships within it: the young children who nakedly love Cleo; the older boy who is more keen on arguing; the grandmother who is at first a silent presence; the flighty mother and the father who, with much maneuvering, manages to fit his too-big car into the narrow garage. He’s obviously not fitting in and soon goes on a work trip to Canada that extends indefinitely, leaving his wife Sophia (Marina de Tavira) in a state. Meanwhile, Chloe’s relationship with martial arts expert Fermin (Jorge Antonio Guerrero) seems to be going well until she misses her period and Fermin ditches her in a smoky cinema. The story is relatively scant and, as with Children of Men, what is truly fascinating is often happening in the background. Political agitation, marching bands, a human cannonball, a television strong man and unrest over land grabs all sound like background music until they unexpectedly and sometimes violent intrude into the lives of the protagonists. A poster for the 1970 World Cup glimpsed on the door of a wardrobe, the music of the knife sharpener, playing his pipe as he wheels his cart down the street, all have the vivid feel of deeply imprinted nostalgia. Likewise, the street scenes pass in front of Cuarón’s lens, building up a layered palimpsest of social life, street vendors, people eating in restaurants, students preparing a protest, militias training in public squares. It’s fitting that Cuarón is also the cinematographer here, as Roma is a deeply personal handsome vision. Cuarón is a master at visual storytelling, pointing to a small change in the frame that will be important later on. A scene where the children get into trouble swimming in the ocean is as thrilling and tense as anything in Gravity. The depth of his focus and the black and white photographer that is so crisp and varied as to belie its reductive moniker. Good black and white photography is always in colour and this is as good as it gets. There are hints of Bergman and Fellini in the mix here too.